A P-T Diagram for Water type of property diagram. Figure 10 is the P- T diagram for pure water. A P-T diagram can be constructed for any pure substance. A P-T diagram is different from a P-T diagram in one particularly important way. There are regions on a P-n diagram in which two phases exist together. In the liquid-vapor region in Figure 10, water and steam exist together. For example, at point A, water with a specific volume (nf ), given by point B, exists together with steam with a specific volume (ng ), given by point C. The dotted lines on Figure 10 are lines of constant temperature. 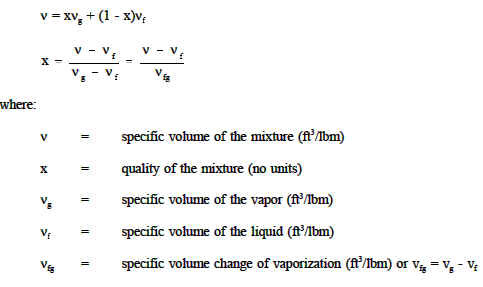 The quality of the mixture at any point in the liquid-vapor region can be found because the specific volumes of water, steam, and the mixture are all known. The quality can be found using the following relationship.